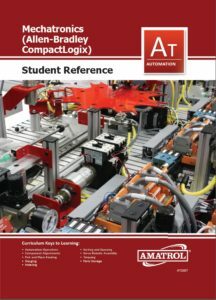 Amatrol’s 87-MS2, Gauging, is station 2 of the 870 Mechatronics Learning System. 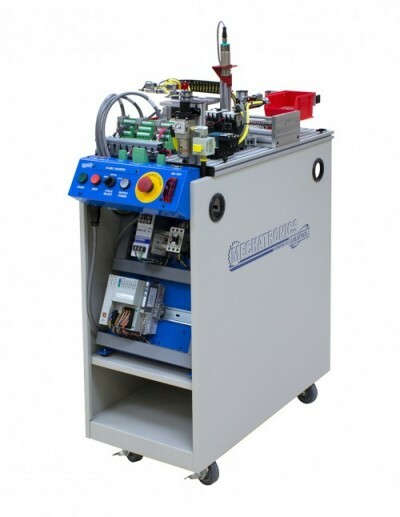 The 87-MS2 station is a small mechatronics system in itself with multiple, integrated technologies that can be used stand-alone or in combination with other stations. 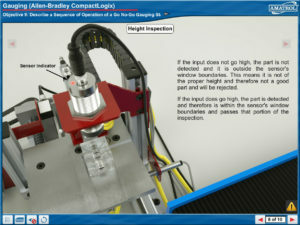 Industrial safety and operation are emphasized on all Amatrol mechatronic stations. The Gauging station teaches interfacing, problem solving, programming, sequencing and operation for go/no-go gauging, analog sensor adjustment, non-servo electric traverse axis, synchronous belt drive, ball screw drives and part rejection/transfer. The 87-MS2 performs a number of quality inspections in the process of assembling a working industrial directional control valve. The 87-MS2 is a mobile training workstation with slotted work surface that contains an operator station, ultrasonic measurement module, proximity gauging module, part transfer module, part reject module, finished parts storage module, parts set, a pneumatic distribution module as well as an electrical distribution module, an electro-pneumatic valve manifold, and a digital I/O interface module.